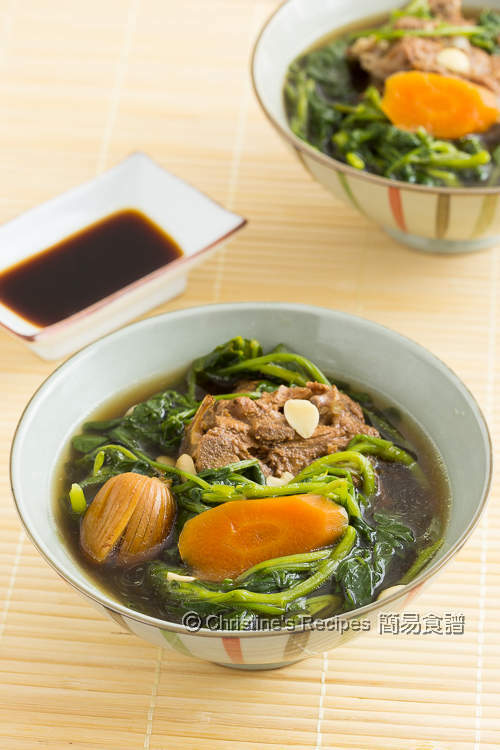 I often like using watercress to make Chinese long-boiled soup (老火湯). Watercress and monk fruit soup is one of my favourites. It’s both comforting and nourishing. To make watercress soup, if not doing it right, it tastes bitter. 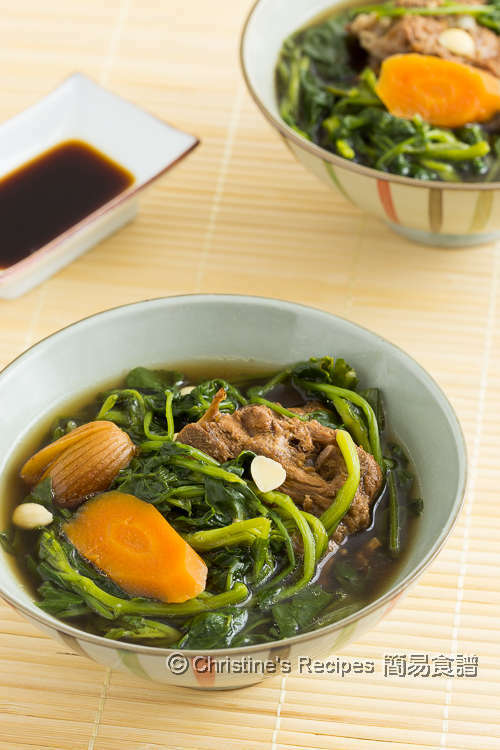 Some of my readers asked me if I have any tips on removing the bitterness of watercress soup. Yes, I have. My mother-in-law, an expert of making watercress soup, once taught me her trick of how to make watercress soup without bitterness. It’s so simple. You need to add the watercress in vigorously boiling water in batches, not in warm water or anywhere not up to the boil. Then your soup won’t give you bitterness. Another unique ingredient used in this watercress soup is monk fruit (aka luo han guo, Buddha fruit, or longevity fruit, 羅漢果). It can help to boost our immune system and facilitate blood vessel health. You don’t need to add the whole fruit. Half of it is enough for this recipe. Reserve the other half for cooking soups next time. Top middle: Monk fruit. Top right: Monk fruit cut in halves. This soup tastes savoury with a mild sweetness, giving you a refreshing feel. It’s suitable for consuming on any days throughout the year. Rinse the watercress. For the last rinse, add 1 heaped teaspoon of salt into the water and soak the watercress for about 15 minutes. Drain well. Set aside. Put the pork bones in room temperature water. 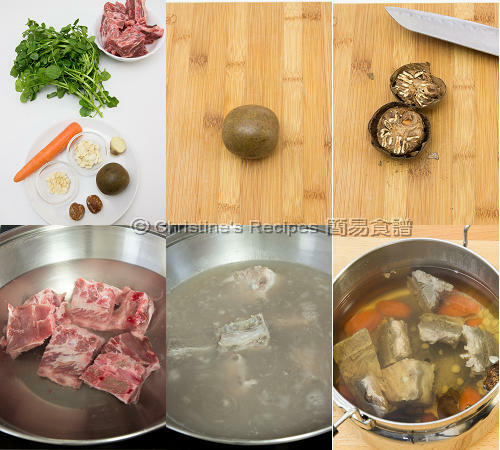 Cook over high-medium heat to remove the blood and impurities, about 5 to 8 minutes. (Note: the soup will be clear by doing this step.) Drain up the pork bones. Rinse under tap water. Drain well again. In a large deep pot, add 2 ½ litres of water, pork bones, watercress and all other ingredients. Bring to boil over high heat. Reduce heat to medium-low, and simmer for 2 to 2 ½ hours, until the flavours are imparted in soup. Season with salt. Serve hot. I used to soak watercress in salted water in the last rinse. It helps remove residual pesticides or buds if there’s any. Chinese watercress is available at Asian grocers. You need to add the watercress in vigorously boiling water. Then your soup won't be bitter. thank you for your wonderful recipes! would you consider making 霸王花 soup too? i'd love to see your methods. Thanks for your suggestion. Will do it when I get some 霸王花. YUMMY! Thanks for the tip too, Christine. Glad that you like the tip. monk fruit--is it fresh or dried? I used dried ones, from Asian grocers. Christine, can this be done in a pressure cooker as well? Sure, pressure cooker can make soup.